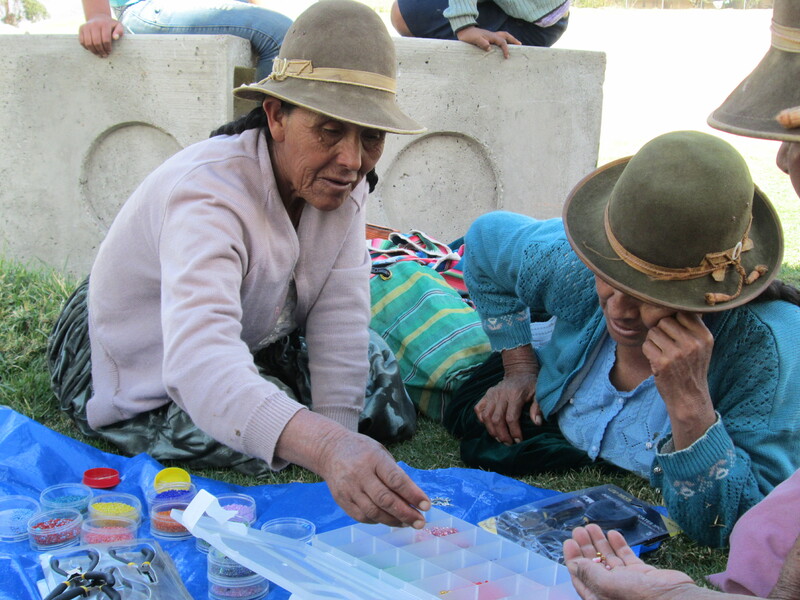 Thanks to the generosity of Ruraq Maki, the 4th annual jewelry making workshop was held beside the Huancarani soccer field in early September. Amanda Smiles, founder of Ruraq Maki, contracted a vehicle which was packed with hitchhikers headed to their farms further into the rural countryside. The women were delighted for a social break from their daily labors while still having a productive day. Three men waiting to hitch a ride to Independencia joined in and made earrings for their wives. Doña Narciza arrived on the verge of collapse having carried 25 pounds of corn kernels in her aguayo for the hour long walk from her farm. 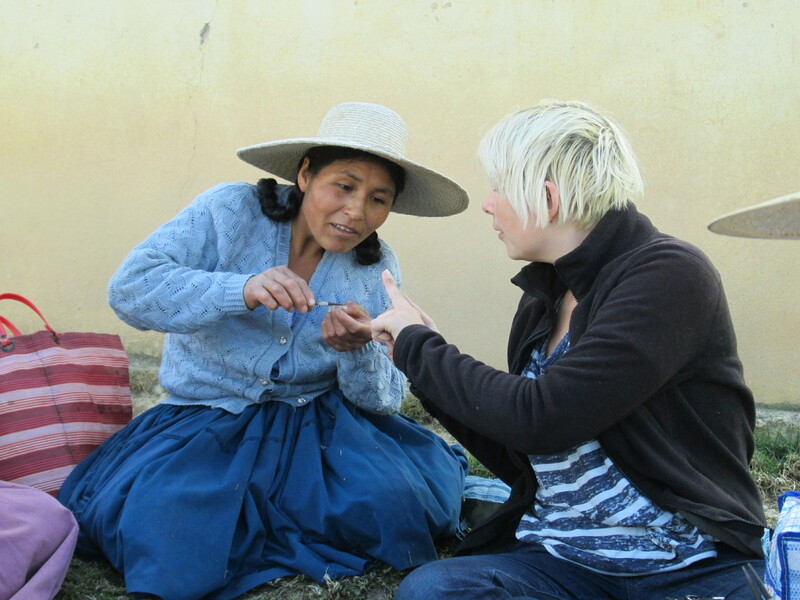 Dorinda had inquired about buying corn for flour and to make tortillas, and was properly embarrassed by the effort made to make the delivery. From her hand carry Doña Narciza produced a bowl of rice, potatoes, chuño, and eggs for the visitors still warm having been insulated in a weaving. 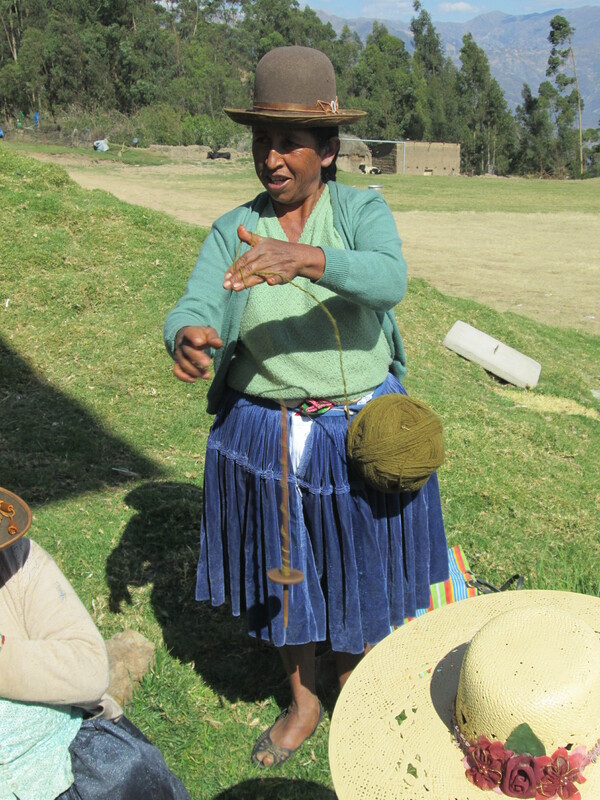 She´d also packed a huge ball of natural dyed yarn that she attached to the sash of her pollera (skirt) to ply. It will be woven into a blanket. 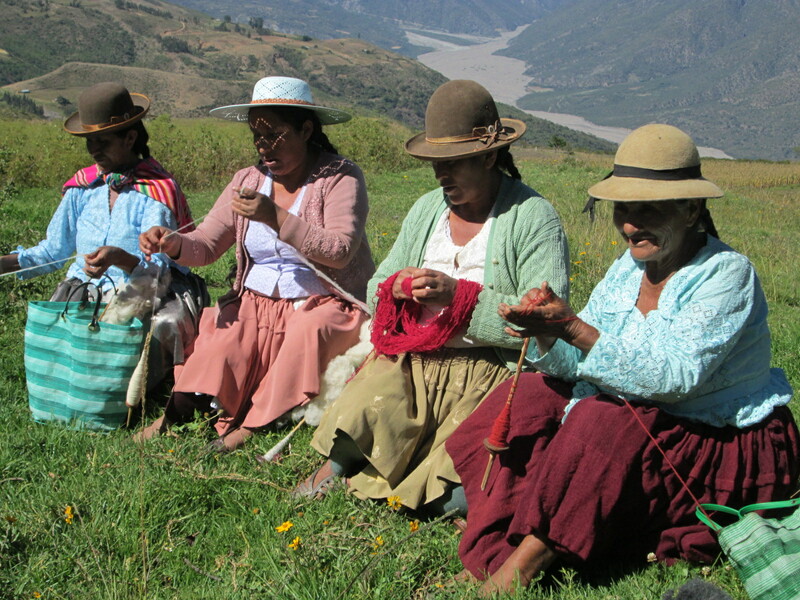 Although the weavers switched from brightly colored synthetic yarn and synthetic dyed local wool to weaving with natural dyed yarns in 2007 for their weavings to sell they continued to use the brightly dyed yarn for weavings for their homes and for rituals. Just in the past two years have weavers commented that they have chosen to use natural dyed yarns for home use. After the jewelry making workshop there was an informal meeting to discuss the quality of the weavings and the upcoming Spinzilla spinning week. Some of the yoga mat straps ordered by PAZA were delivered with a lack of color contrast. Doña Máxima held up 2 examples where the colors ran together instead of standing out in the eye catching manner that the weavers usually warp. 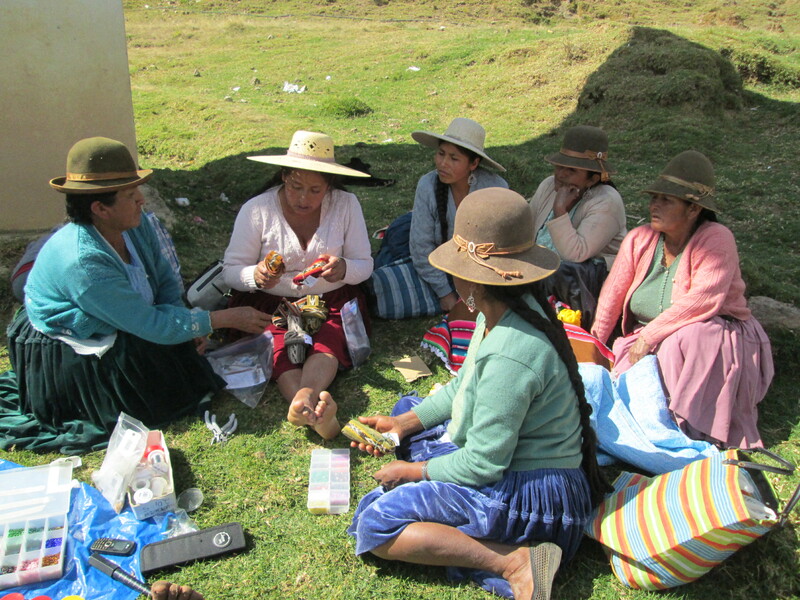 Doña Máxima had discussed the problem a few days prior with 4 of the Huancarani weavers who had visited the PAZA workshop during market day. Doña Julia who had attended that discussion thought to bring her balls of yarn, which she had to pack on her for the hour long walk to the jewelry workshop. 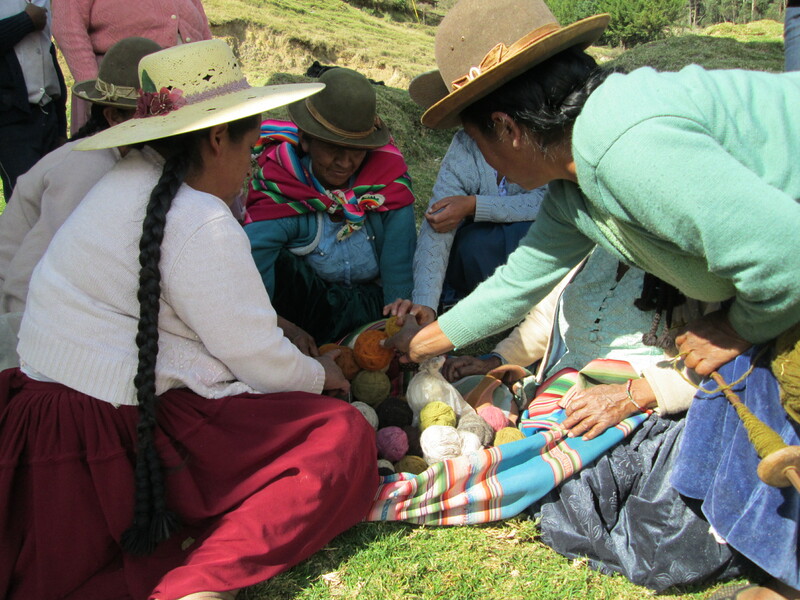 The women gathered around when she upended her bag of yarn and took turns placing the natural dyed balls of yarn together to observe and comment on the effect of various color combinations. There was a brief meeting concerning the upcoming Spinzilla spinning week. 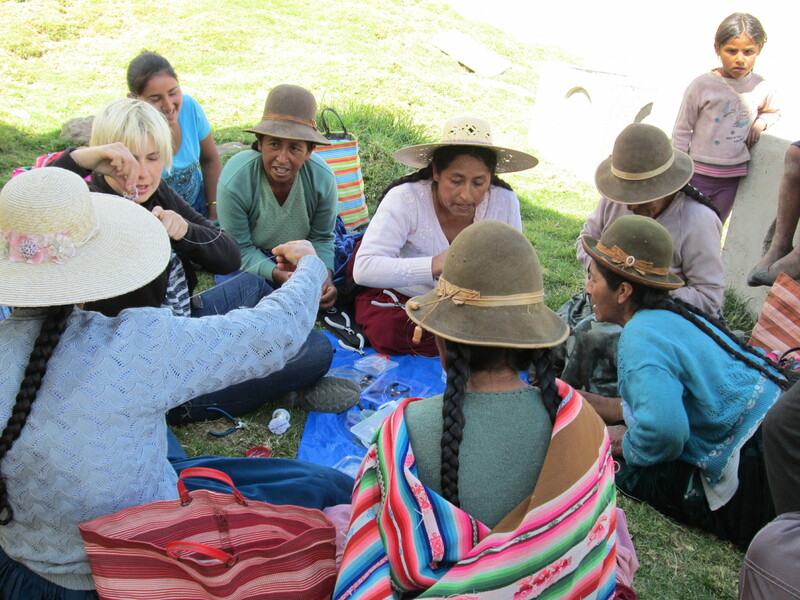 Doña Máxima, the Captain of the Cloth Roads/Team Warmis Phuskadoras, reminded the weavers to prepare their yarn. Weavers such as Doña Narciza and Doña Eulalia who have herds of goats instead of sheep will need to purchase sheepskins from other weavers. The sheepskins will be washed, sheared, and hand worked into roving. Carding combs are not used. 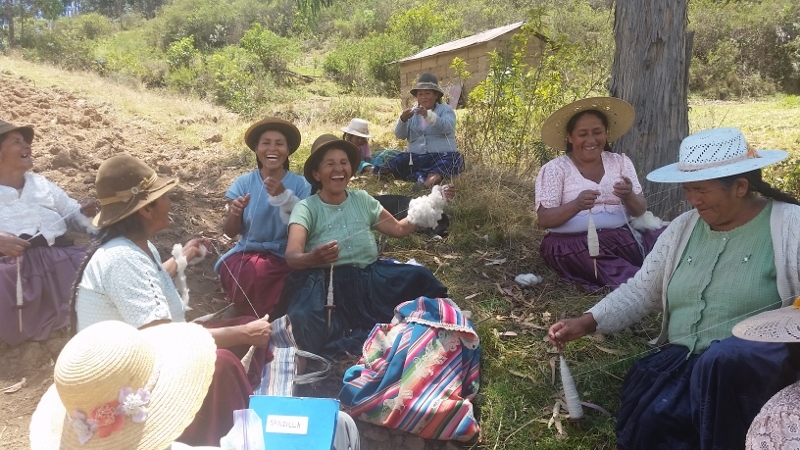 The day was set for Doña Máxima, Dorinda, and a social media volunteer to travel to Huancarani during spinning week to take photos and check in with the participants to see if there are any concerns. Planning for the measuring of the handspun yardage was also discussed. On the drive back to Independencia, Doña Eulalia´s goats were spotted miles away from the soccer field. Doña Máxima lamented that Doña Eulalia should have hitched a ride with us. Doña Eulalia stopped by the PAZA workshop the following Sunday to deliver 2 beautifully color coordinated yoga mat straps and was queried about her wayward goats. She said she searched for hours and returned home at dark without them. The following day she and her sons headed out and finally encountered them high on a mountaintop where a few of the females had given birth. She´d worried all night about predators and was delighted to find the entire herd not only intact but larger.